Category Archives for "Portable Generators"
Yamaha is a leader in many aspects and now, they have become one of the best with generators. There are several features and systems which made the Yamaha EF2000iSv2 a great model. It is small, portable and convenient, but it is still loaded with amazing capabilities and it is truly a desirable unit. The unit we are reviewing is a newer generation generator. Correspondingly, it has some advantages, compared to older versions. Smart throttle is one of them. The system is actually complicated, so there is no need to explain how it actually works. A much better alternative is to explain what it does. First and foremost, it will match the throttle according to the load. Higher load means higher throttle. As the result, users can expect longer running time on a single time (10.5 hours) and quieter operation. The unit will generate between 51.5 dBA and 61 dBA. Another feature you will definitely appreciate is the twin-tech system. It allows to the users to connect two generators in order to get a higher energy output and meet more demanding operations. A great addition is the ability to connect a newer, Yamaha EF2000iSv2 and older, EF2000iS versions! Together, they will produce up to 30 amps. In addition, the procedure is simple and doesn’t require any special knowledge, although, future owners will need a cable for connection. Here we have another system which is desirable. Using clever technologies, the generator has the ability to adjust and maintain voltage and frequency, within 1%. In other words, the power output will stay the same and be well-maintained regardless of the energy consumption. Just to add, the frequency will also be within 1%. For sensitive devices, which require stable electricity, this is an extremely important system and it really makes the generator even better. Starting the generator is easier than ever, thanks to the automatic decompression system. What it does is reduce the comparison in the cylinder. Starting the engine is then much easier, obviously. Once the engine starts, the compression will be restored to normal, meaning that the generator will continue to work in the optimal range. Auto warms up feature is implemented as well. In general, the engine will run on higher RPMs during cold starts. It heats up the engine to the working temperature, allowing for the users to get the highest electricity output (1600 running watts and 2000 starting watts) as soon as possible. There are no other words to define the Yamaha EF2000iSv2 except perfection. It is a truly amazing generator, with all the features, quality and even with superior systems. If the price isn’t an issue, this is the generator to choose right now. Honda is popular among buyers due to its super cool series of products that ensure long life service with pocket friendly price tags. This brand is serving millions of buyers from fast 50 years and is still developing its high quality generator units for homeowners. While making selection of a good generator, we often check its essential features like low emission rates, fuel efficiency, user-friendliness and build quality. Here we are going to talk about Honda EU2000I Super Quiet 2000 Watt Portable Generator with Inverter. This product is finding great applications for residential, industrial and recreational needs. Find some time to read the review below to collect detailed information about all essential features of this classic generator unit. You will be glad to know that in the market of many 1000 Watt rated generators, Honda has recently launched its new generator design with 2000 Watt starting power rating. The system stabilized to 1600 Watt continuous power and serves all appliances with safety. It is loaded with a fuel efficient 4 stroke air cooled overhead valve type PHC engine that leads to incredible service. When the system is connected to a full load, it can serve up to 3.4 hours at an average whereas, for quarter load, it ensures 8-hour service duration. Honda has loaded Eco-Throttle System controls to this generator so that its engine speeds can be controlled automatically as per the need of load. It senses the connected appliances first and then switches between different speed levels to serve the purpose. This fuel-efficient design also helps to reduce the noise level with the controlled operation. The overall weight of Honda EU2000I Super Quiet 2000 Watt Portable Generator with Inverter is 46 pounds so it can be moved easily from one location to another. The overall dimension of this generator is 20x12x17 inches only so you will find it best choice for recreation applications. Manufacturers claim its noise rating somewhere around 59 decibels on full load whereas it reduces up to 53 decibels with the quarter load. Users rate it as a super quiet machine that never even causes any disturbance in conversations. It is finished with special sound damping materials that also assist in low noise performance. This system is protected with the help of oil alert mechanism that shuts off the engine automatically when oil falls below a threshold level. Other than this, it has automatic voltage regulator system and overload protection circuit. You will find its best choice to charge your sensitive gadgets with ease. Honda EU2000I Super Quiet 2000 Watt Portable Generator with Inverter is certified by CARB, CSA, and EPA for its feature-rich performance. It is currently available with limited 3 years warranty so you can prefer to place an order now to avail a risk-free purchase. The most annoying thing that could happen in our life is the power cut. The current technology freak generation cannot imagine a single moment without electricity but what if you find proper light at a neighbor’s house and you are still living in dark. Actually, the best solution is to have your own power generation system and WEN 56200i Super Quiet 2000-Watt Portable Inverter Generator can help you to do that. There is no doubt to say that it is quite difficult to make a decision about buying a new generator because the market is loaded with so many designs launched from different brands. In such situation, a comprehensive review about this latest super quite generator can help you to make the right decision about your upcoming investment. The great news is that WEN 56200i Inverter Generator works with pure sine wave output that is free from distortion so users can ensure safe operation of all appliances in the house. This AC power outlet can help buyers to charge their laptop, cell phone, PC, and tablets without any trouble related to harmonic distortion. We cannot take the risk for engine failures as it can soon turn out into a big disaster for homeowners. But there is nothing to worry about WEN 56200i Super Quiet 2000 Watt Portable Inverter Generator because professionals rate it highly reliable with its 79.7 cc 4-stroke OHV engine. It is capable enough to run home appliances with full safety. How can we forget to talk about the essential feature of this latest Inverter Generator unit? It is popular enough for its super quiet operation so that family members can have a disturbance-free good night sleep. Professionals have tested this generator for several real-time applications and this product serves as the best companion for families with its great fuel efficiency. It is a budget-friendly solution for buyers as it needs very less fuel input to run perfectly. WEN 56200i Super Quiet 2000-Watt Portable Inverter Generator is finished with a compact and lightweight design so that users can carry it anywhere as per their requirement. The overall weight of the generator is 48 pounds only so a person can carry it single handed with ease. The most impressive feature of this Inverter Generator is its ability to serve with dual power. Yeah! By just adding a cable link, you can convert this 2000 Watt generator to work on 4000 Watt peak power. This is definitely a great choice for professionals who want to work on loaded sites. With all such incredible features, WEN 56200i Super Quiet 2000 Watt Portable Inverter Generator becomes a must buy choice for every homeowner. It offers great performance with safe power generation ability. People find it quite easy to use and it can accompany them on outdoor locations as well. It is definitely good to place an order for this budget-friendly product right now and it will soon reach your doorstep. When we hear the name Westinghouse, it drives a feeling of rich quality and satisfactory performance. There are so many products available in the market from this brand and they are serving to all users. With a wide set of features and advanced design, Westinghouse is leading the marketing by beating all competitors. It has proven its edge with the rock-solid reliability and innovative technology. 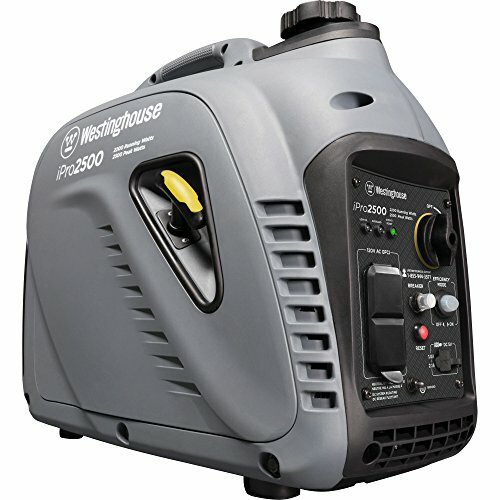 Westinghouse iGen2500 Portable Inverter Generator is a recent addition to Westinghouse Generator series. As usual, the product is loaded with wide range of features so it is good to go through the detailed review before making a final decision about a purchase. Failures of inverter generator systems are not tolerable so it is always essential to ensure the utmost functionality of the engine. This machine is loaded with a 99 cc 4 stroke engine that delivers 2500 peak power so you will find it an ideal choice for tailgating, camping, home backup as well as recreational needs. It can easily power-up your fridge so that your food can stay fresh and can also charge your sensitive gadgets like mobiles, laptops, and computers etc. The average harmonic distortion of Westinghouse iGen2500 Portable Inverter Generator is observed below 3% so it ensures delivery of stable output. Homeowners often search for a portable and compact inverter generator unit that can be fixed in lesser space and can also move to other locations when needed. This portable inverter generator unit is designed with an overall weight of 48 pounds so that anyone can carry it with ease. The carry handle assists in easy transportation. While choosing a good quality generator unit, fuel efficiency is definitely an essential parameter. The machine is considered best if it can work for a longer duration by consuming limited fuel. iGen2500 is rated high for its fuel efficiency, it means you can handle your routine needs without spending more on your fuel requirements. When compared to the traditional systems, it ensures 30 to 50% higher fuel efficiency. You will be glad to know that Westinghouse iGen2500 Portable Inverter Generator is designed to serve as super quiet operation. It is designed with Double Insulated Acoustic Enclosure that helps to suppress noise effectively so that you can enjoy noise free service in-house. It also suffers minimum vibrations and noise is further reduced with the help of low tone muffler and asymmetrical cooling fan. The most interesting feature of Westinghouse iGen2500 Portable Inverter Generator is its ability to provide double power when two systems are connected together. The cord ensures safe and easy connections and users find it best solution for their high power requirements at the time or occasions. Westinghouse iGen2500 Portable Inverter Generator received 4.5 rating out of 5 for its impressive performance and it is one of the best-sold products from this brand. It is definitely the best generator for your house and can serve you for a long run without any trouble. There are so many inverter generator units available in the market and each one of them is loaded with unique features. It is really good to go through specifications of each product before making a final decision about your purchase. Indeed, it is a big investment so every buyer needs to be careful about choosing right machine. It is not just about price when we talk about an inverter generator machine, it is desired to be quiet, durable, powerful and easy to use. After checking so many products in the market, here we have picked Westinghouse iPro2500 Industrial Inverter Generator for today’s review. Below you will find all essential details about its useful features and soon you will be able to know whether it can meet your requirements or not. Keep reading. This inverter generator unit is designed to assist users with easy mobility as its overall weight is somewhere around 48 lbs only. You will find a built-in type carry handle attached to this machine that assists in easy movements. It is compact enough so that one person can move it easily from one place to another. Westinghouse iPro2500 Industrial Inverter Generator is loaded with 2 USB ports that work on 5V DC and it also features 120 VAC/ 20 Amp outlets so that users can easily charge their home appliances and gadgets. You can ensure complete safety for your sensitive electronic devices like computers, laptops, and mobile etc. You will be glad to know that manufacturers have designed this generator inverter unit with the double insulted acoustic enclosure so that homeowners can enjoy noise-free operation. Also, it has low tone muffles and cooling fans that ensure noise-free operation even when machine keeps on working for hours. You will never find any disturbance in normal conversations due to this machine. When compared to traditional generators, Westinghouse iPro2500 Industrial Inverter Generator leads to 35% higher fuel efficiency. It can serve up to 7.7 hours with 1.0 gallon of gas while working on 25% load. This feature makes it stand out against many high-end products available in the market. The best news for buyers is that Westinghouse iPro2500 Industrial Inverter Generator is certified by CSA and EPA for its incredible work performance. This product comes with a limited 3-year warranty that makes it a risk-free and safe purchase for homeowners. You can also ensure fast response for all queries from the support team. Westinghouse is well known for its wide range of power generators. The brand is gaining huge popularity from last few years and has a big network of trusted buyers. Westinghouse iPro2500 Industrial Inverter Generator is a feature-rich addition to its power generator series and it ensures complete safety for users with the impressive feature set. It is definitely a must buy product and you should place an order to buy it now. There are lots of power generators in the market so buyers often face big confusion while buying a product for their routine needs. Everyone wants to make the best use from such a big investment but to ensure satisfactory performance it is important to take a careful decision about your purchase. Prefer to check all features and specifications before buying a new inverter generator and the best idea is to go through detailed review. Here we are going to talk about Briggs & Stratton 30651 P2200 PowerSmart Series Portable 2200-Watt Inverter Generator with Parallel Capability. It is loaded with so many advanced features and is receiving great attention from buyers around the world. If you are planning to buy a new power source for your house then prefer to go through the details below. Hope! It will help you to make a safe decision about your investment. This inverter generator system is designed with 110cc advanced OHV engine that generates 2200 Watts starting power and ensures stable 1700 Watt running power. Note that 1-gallon fuel tank can serve you for 6 hours when connected to 25% load. It is definitely a satisfactory service range for homeowners. The most interesting part is its power smart mode that leads to low noise operation with the fuel-saving mechanism. This machine can adjust its engine speed as per applied electrical load. The overall dimension of Briggs & Stratton 30651 P2200 PowerSmart Series Portable 2200-Watt Inverter Generator is 21X12.5X17.35 inches with an overall weight of 54 lbs only. The machine is loaded with an H handle that makes it portable enough; two people can easily take it from one place to another. Professionals find it 45% lighter when compared to traditional camping generator system. The device panel is loaded with three LEDs where green one is dedicated to output, yellow indicates low oil condition and the third red LED is installed for overload alerts. This panel ensures complete safety of the system and time to time indications to users so that they can make proper arrangements for resources. Also, the circuit breaker protection system ensures complete safety with its push to resent design. Briggs & Stratton 30651 P2200 PowerSmart Series Portable 2200-Watt Inverter Generator also has one control panel with three essential outlets as two household and one DC along with USB Adapter. It means users can easily connect a wide range of personal electronic devices, gadgets, TVs, music systems and lights etc to this power generator unit. You will definitely love to know that it is designed to work with super quiet operation with its 59dB operation volume. It never causes a disturbance in conversations. Also, the engine speed is adjusted automatically to protect sensitive electronic devices. The wide set of advanced features make this power system a must buy the product for all homeowners. Briggs & Stratton is a trustworthy brand and you can ensure long life service from this latest inverter generator unit. It is the right time to place an order for your product now. Copyright 2018 Top 10 Best Portable Power Generators - Top10Generators.com.